That’s a throwaway line from a recent film, “Her” (good movie) and not entirely original; “[something is] a story we tell ourselves” first appeared around 1960 and has become exponentially more popular since then, as shown by Google’s Ngram Viewer. What makes this version memorable, however, is that it’s uniquely wrong. History (for the most part) is a story we DON’T keep telling ourselves. We only talk about an event when it’s big and momentous or directly related to our lives in the here and now. A more accurate version of the quote would be, “The past is just a story we keep forgetting to tell ourselves” and as a result, we don’t learn from the past and find ourselves repeating it. History is not a guide to understand our march toward the future; history is a treadmill. The only vaccine that existed in the early 20th century was against smallpox (MMR, HepB, DTaP, RV or any of the other modern vaccines were decades away). Since 1889 California had required all children to present a smallpox vaccination certificate when they registered for school. Opponents lobbied Sacramento to pass a couple of bills repealing the law but governors vetoed the legislation both times. The state Supreme Court upheld the requirement in 1904 and the U.S. Supreme Court ruled the same way the following year. Yet the anti-vaccinationists never gave up; they kept forming grassroots anti chapters, signing repeal petitions and writing letters. At the start of every school year some parents would keep their kids at home or protest to the school board – some apparently not over vaccine anxiety but because they couldn’t afford to consult a doctor. More on this in a moment. At the same time a new anti-vaccine ally popped up in California: The chiropractors. Over a century ago there were some three dozen types of physicians; some were licensed in some states, with many like Mrs. Preston of Cloverdale, operating in a gray area by claiming they were not really practicing medicine. Among the fields of quackery were eclecticism (adjusting the 12 “tissue salts” in the body), electropathy, homeopathy, hydropathy, vitaopathy, psychiropathy (apparently a combo of hypnotism with massage) and naturopathy. The first chiropractor appeared in the Bay Area in 1904 and one set up office in Santa Rosa five years later. By 1922 there were seven in the City of Roses, most of them clustered in the new Rosenberg building at the corner of Fourth and Mendocino. 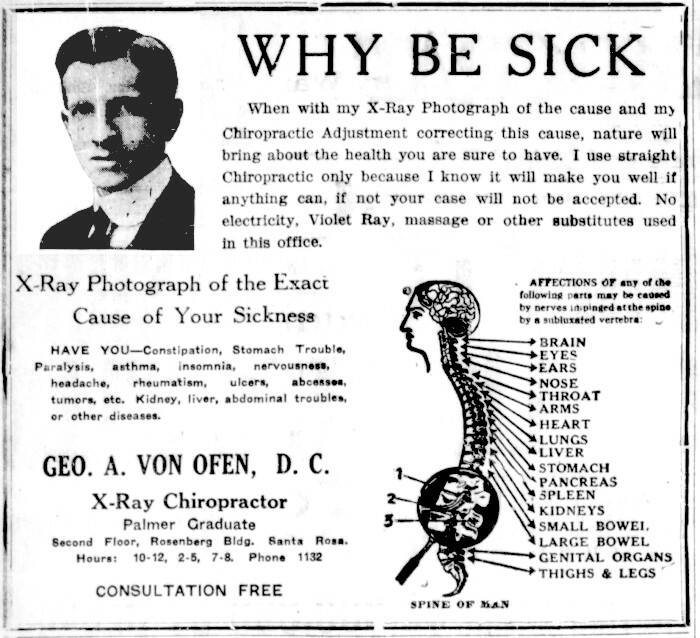 They distinguished themselves from quack healers using gimmicks and sold themselves as pioneers of a new wave of medicine embracing up-to-date technology – note the ad below for the “X-ray chiropractor.” They were men of science whose livelihood depended upon peddling notions that germs didn’t cause disease and vaccines were a hoax. 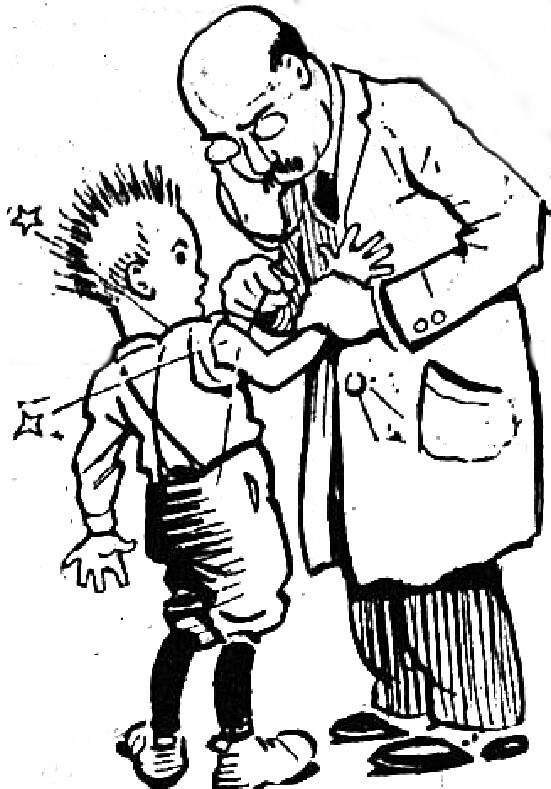 Their basic text, the 1906 “Science of Chiropractic,” denounced vaccinations as dangerous and often lethal. (Don’t miss the long section on sales and marketing where students were promised they would make lots of money.) Written by chiropractics founder Daniel David Palmer – who had earlier claimed he possessed magnetic hands – the book was filled with dangerous misinformation. Smallpox was not contagious (he said it’s spread by bedbugs) and spinal adjustments could cure polio, asthma and cancers (which were caused by “too much heat produced by calorific nerves”). It spread fear about vaccines with its heart-wrenching photos of deceased children along with anecdotes from their bereaved parents and by making outrageous statements which were not remotely true, such as “[vaccination] has now been made a crime in England”. It’s surely no coincidence the antis’ literature soon began to mimic his style. There was more hyperbole (a 1907 letter in the Santa Rosa Republican claimed “vaccination is responsible for more or less of leprosy”) and conspiracy-think: Doctors were trying to bamboozle people by using “cooked-up statistics,” all in order to perform a large scale experiment on the public and/or make themselves rich on fees from giving injections. To support their case, the antis followed Palmer’s example by leaning hard on unverifiable anecdotes and outright lying about events – see sidebar. The antis loved quoting experts, as long as they knew nothing about public health medicine or were comfortably deceased. The PD printed a letter in 1913 from Samuel Taylor of the California Anti-Compulsory Vaccination League which claimed to quote “noted physicians” such as Dr. A. Vogt of Berne University, who supposedly examined the records of 400,000 vaccinations and lost all confidence that smallpox vaccination worked. “Vaccination is a curse,” another doc supposedly said. Taylor never revealed he apparently rustled his info from pamphlets of earlier anti-vaccinationists and the supposed quotes related back as far as the Franco-Prussian War of 1870. This little assortment of dismal tidbits can be found reprinted in American newspapers through the early 1950s. Just a hint to parents. In Winnetka, Illinois, girls in the new Trier High School were compelled to submit to complete physical examination. They were taken to the gymnasium and stripped of all their clothing. In the presence of other girls they were examined. A request from their parents to excuse them, and a physician’s certificate were ignored. The Inspector and the school authorities held themselves superior to both parents and family physician. The girls were led to the gymnasium and compelled to submit. When a protest was filed on the ground that the Schools were free and no physical examination could be required as a qualification of admission, the newspapers published the story. The board of education met, and decided that the physical examination was not required for admission to the high school, which was public and free. In truth, there was a complaint from one 16 year-old girl who signed up for a physical education class; she and about ten other girls were brought to the female instructor’s office and told to change into robes, as they needed to be checked for skin diseases before being allowed to use the swimming pool. The facts were altered to evoke a reader’s feelings of disgust and anger – emotions which are well-known for their success at leading to people develop strong negative opinions about something.2 Taylor’s goal was to polarize the public’s views against schoolkids being “compelled to submit” to authorities for medical reasons. Less than a year later they won a bigger prize. The state made vaccination optional, and any family with “conscientious scruples against vaccination” could opt-out as long as they submitted a no-consent form at the start of the school year. The new law declared any students not vaccinated would be blocked from attending only in the case of an epidemic. Smallpox cases quickly began to increase. Over the next eighteen months there were 279 reported cases in the state with at least ten deaths (that was up to March, 1913; final statistics for that year alone show 800 cases and 15 dead). In Berkeley, five of the eight people who contracted smallpox died. Unbelievably, propagandist Samuel Taylor put a positive spin on this news: “The percentage was very small, about one case to every eight thousand inhabitants.” Not reassured, over a thousand UC/Berkeley students rushed to get revaccinated or receive their first vaccine. Taylor, always a publicity hound, also pushed his way into the newspapers during a dramatic 1914 incident in Oakland. It was discovered that a conductor on the train coming from Oregon was infected and the cars were sidetracked before reaching the station. Oakland health officer Dr. Allen Gillihan, with assistants and police, boarded the train and forcibly vaccinated the 56 passengers. (Two mothers with small children refused and were not vaccinated.) Taylor made the papers by telling the press an assemblyman was going to introduce an emergency bill to have manslaughter brought against Dr. Gillihan should any of the passengers die because of the vaccine – although odds of which were nil. For the rest of the 1910s all was (mostly) quiet on the anti front – nothing more can even be found from the very vocal Mr. Taylor. “The number of parents who are conscientiously opposed to vaccination has dwindled from an alarmingly large number to practically none at all,” remarked the Press Democrat in 1919. That year over 500 children received vaccinations paid for by the Santa Rosa school district, so the expense of a doctor’s visit must have played a significant part in earlier protests. Dr. Gillihan – who became Santa Rosa’s health officer not long after the train vaccination – was now an inspector for the State Board of Health, and similarly vaccinated 1,800 in Chico in one week. There he was charged with battery over not having a parent’s vaccination consent, which shows there were still diehards. And that brings us to the watershed year of 1920. The California ballot that year must have puzzled voters. Amid the usual assortment of items regarding taxes and bonds were two propositions which we would today consider feel-good questions. One seemed to oppose the torture of animals; the other stopped schools and the state government from discriminating against sick kids. Who could oppose things like that? Although the items seemed harmless enough, on closer look a more distressing agenda appeared. Prop. 6 would have made vaccination entirely voluntary, turning it into a “don’t ask, don’t tell” issue for schools. Prop. 7 would block all medical research using animals as well as prohibiting smallpox vaccines because it required extracting serum from living cows. There were two other related propositions: Number 5 would create a state board of chiropractors to license themselves (something sought for years via the legislature or voters) and number 8, which regulated opiates and cocaine – curiously, it allowed doctors to prescribe the drugs to addicts, but any medicinal use required filing a report to the state pharmacy board. A speaker from a public health group came to Santa Rosa and spoke on these four proposals, which he dubbed the “Quack Quartette.” His comments (transcribed below) explain the awfulness in all but the drug item. To that I’ll add only the perspective that the chiropractors had been pushing hard for their own licensing board since 1914, and it’s easy to see why; a report from the State Board of Medical Examiners found 2 out of 3 couldn’t pass an examination on basic anatomy. The good news was that the anti-vaccination proposition lost by 56 percent (the chiropractor and vivisection amendments also failed to pass). The bad news is that the legislators still gave the antis their victory. Changes to the state vaccination law in 1921 no longer required teachers to collect vaccination certificates or non-consent slips. If a child in the school district caught smallpox only those who were unvaccinated and exposed to the sick kid would be sent home for quarantine. As it was now impossible for the school to know who was vaccinated and who was not, what did they do? “Students, little Tommy has smallpox and everyone who hasn’t been vaccinated gets to stay home for two weeks. Can I see a show of hands?” That worked out swell, I bet. There were now regularly thousands of cases every year in the state.4 California was fortunate that only the milder form of smallpox was found spreading. Sonoma county was extraordinarily lucky; the only child who became ill here in the early 1920s was a boy in Penngrove. “This is the first case of smallpox in this vicinity for some years and it is causing a scare because smallpox is rapidly gaining in the state owing to carelessness in vaccination and it is serious in several parts of California,” the Petaluma Argus remarked. “There is more smallpox now than for many years and it is increasing at an alarming rate while the illness is more severe than it has been for years and there have been numerous deaths.” That year 56 people died in the state, the highest since before the turn of the century. There were no more anti-vaccination protests, of course; they had been given everything they ever wanted. For those who embrace science and believe it’s not a good idea for people to unnecessarily get sick and die, this has been a depressing story – and it gets worse. Remember Dr. A. Vogt and the other vaccine skeptics from the 1870s who were quoted by Taylor in his letter to the PD? Today you can find many of those exact same quotes rehashed in brand new anti-vaxx books and recent websites – although now scrubbed of dates and any other historical context. Apparently Dr. Vogt is still gnashing his teeth over vaccines some 150 years after his heyday. Maybe there are lessons to glean from the anti-vaccination squabbles of that era, but caution is needed; as a starting point, all of us should have some empathy for the antis prior to 1914 (well, all except for Mr. Taylor). Had I lived back then I might have felt leery about smallpox vaccination, but not because I believed vaccines were phony. There was a certain amount of risk in any doctor visit because medicine was then still in a generally barbaric state – no antibiotics, poor understanding of infection prevention and primitive test equipment for diagnostics. Then there was often a question of whether any particular vaccination worked; that article about the 279 smallpox cases revealed about eight percent had been vaccinated, but not successfully. The failures could have been because the culture was dead, was low potency or the patient’s immune response was too strong. But it took a day or three and an expert eye to tell if a proper pustule had developed, which might mean another visit by the doctor. Also, an additional eight percent of the cases had been vaccinated in childhood but immunity in those vaccines lasted less than a dozen years. And let’s concede some people really did die because of being vaccinated, although even the diehard antis never claimed there were very many (in New York state the ratio was reportedly five in a million in the late 1910s). They didn’t know how to sterilize the live animal serum extracted from cow/calf lymph glands until 1914 and the other vaccine source was using a fresh scab from someone with the disease – certainly a chance of infection either way. Despite all those little risks, the odds of dying from the more aggressive form of smallpox was about one in four, so vaccination was always the wisest course for anyone thinking straight. But none of that mattered because the antis had a simple and effective counterargument – it just didn’t make sense to expose healthy people to a disease in order to prevent them from later getting sick. That’s the most common message repeated in their letters and pamphlets, often with the vaccine being scorned as “filthy,” “disgusting,” “rotten” and see above re: disgust being a most effective way to shape a negative opinion. The anti groups and the chiropractors effectively won the fight through manipulating fears, but the irony was that the champions of vaccines had a much more powerful weapon of this type which wasn’t used – horrific photos of children infected with smallpox. Had these been as well circulated as the antis’ pamphlets, the public would have begged for mass vaccinations. Here’s an example, and I’m linking to a Snopes.com fact-check page to assure Gentle Reader this is not a pre-Photoshop fake image. On that page click through their link to the “Atlas of Clinical Medicine, Surgery, and Pathology” to see more, if you have the stomach. All of this resonates with the anti-vaxx dilemma today. Scientists are continually publishing studies showing modern vaccines cause no harm (PARTICULARLY NO INCREASE IN AUTISM) but that information is ignored by those endlessly tormented by the fear in the air. I visited scores of anti-vaxx websites this week (there are reportedly about 500). Want to know what I found? Not reasoned arguments refuting the science studies – but stock photos of babies crying and cringing from a doctor while receiving a shot. Hello, emotional triggers. 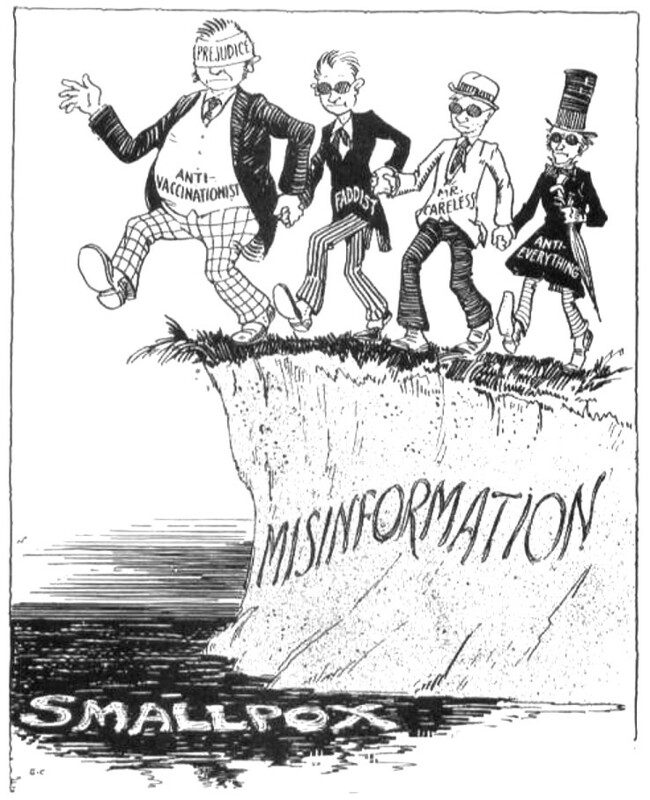 And just as the Press Democrat innocently became an accomplice by printing the antis’ propaganda in 1913, today Facebook and other social media are complicit in spreading misinformation. As of this writing (2019) anti-vaxxers have gamed Amazon to push anti-vaccine books by swarming the site with bad reviews for pro-vaccine books. Thus far the year 2019 is looking a lot like 1912 in the last century’s culture wars, when parents were increasingly opting-out of smallpox vaccinations – which led to the 1,100 percent rise in smallpox cases over the following decade. And now there’s a skyrocketing resurgence of measles because there are regional pockets where parents are likewise choosing to opt-out by claiming religious or moral exemptions. Will the unease of a few again outweigh the needs of the many? If history is indeed a treadmill, brace for a near future where old childhood diseases come roaring back and common ones increase by over a thousand percent. To pretend that can’t happen is folly. It is passing strange that Berkeley, a community of more than average intelligence, lying as it does in the very shadow of the university, is the center and hotbed of the anti-vaccination movement. There are, it is true, some other advocates of the spread of smallpox in other parts of the state. Santa Cruz has a small colony, and Los Angeles, which is the home of isms and schisms, only second to San Diego, has also a few friends of the dread disease; but Berkeley has the doubtful honor of being the center of the movement to prevent the stamping out of smallpox; and already, the primaries being over, has started once more to carry out its ideas at the expense of the health of the people of the state. Once more the fight for safety must be begun also. The sole argument the antis have to offer is that some children have died from the use of bad vaccine, and that others have contracted serious diseases from the use of impure scabs. No one will deny either contention, and if it were simply a question of insisting that the best of vaccine should always be used and that the physician should be held responsible for the condition of the matter and of the instruments he uses, there would be no dispute over the subject anywhere in the state. But with the logic of fanaticism, the Berkeleyites insist that no one shall be vaccinated because some have died and others have been made ill as a result of carelessness. They insist that smallpox shall not be stopped: that all the children !n the state shall be exposed to danger and disfigurement because some few persons do not want their children protected. The vast majority of the people of the country, of the civilized world, believe in vaccination, and yet the infinitesimal minority, against all experience, against the well established facts in the matter, against every teaching of modern medicine, insist that the vast majority must suffer because of their disapproval and absurd theories. Any student of history knows what a dread disease smallpox was for centuries. Any reader knows that it is a minor disease since the utility of vaccination was discovered. Here in California we have only one case of smallpox in five thousand cases of disease, and only one death in one hundred eases of smallpox. In a word, thanks to the thorough vaccination of the children and adults of California, the disease has practically been stamped out here, and yet a few fanatics insist that such desirable and wonderful results shall be destroyed, because once or twice impure vaccine was used. It is time that the people of the state aroused themselves and let their views on this subject be known to their representatives in the legislature, or it is possible that again, as has occurred severnl times before, the legislature will pass a law repealing the one on the statute books, and an epidemic of smallpox will result. Only the veto of the Governor saved this state the last time the experiment was tried, and as neither of the candidates for the governorship have announced their views on the subject, it is safest to kill the propaganda when it first appears in the introduction of repeal bills in either house. This is not a trifling matter. It is a very serious one. and one that should be watched carefully and fought energetically. Vaccination furnished the topic of the nearest approach to a fight in the Assembly Wednesday in the course of the passage of the few bills whose authors had energy enough to call them up for consideration when they were reached on the file. But even this near approach to a clash between the members of the lower House failed to furnish more that a slight diversion from the routine of the day. with but eight dissenting voices, Senator Hurd’s bill (Senate bill No. 655) was passed by the Assembly and sent to the Governor for his approval of its provisions removing the requirement of vaccination as a condition of admission to the public schools of the State. The bill makes vaccination of children optional with parents. … Assemblymen Schmitt and Chandler were the only open opponents of the bill in the discussion prior to its passage. Chandler declared that “there are a few old women down in my district who are against vaccination, but I am in favor of it and will vote against this bill.” Schmitt declared that he would vote against the bill in question because of his fear that its passage would lead to the ultimate repeal of all legislation pertaining to vaccination. The citizens of Berkeley have been thrown into a deplorable condition by an over zealous Health Board, after the discovery of eight cases of smallpox. The percentage was very small, about one case to every eight thousand inhabitants. So insistent were these officials for WHOLESALE VACCINATION, they threw the people into a panic, thereby causing a withdrawal of several hundred pupils from certain schools. Thereupon the School Board deemed it wise to close ALL schools. However, that did not prevent them from insisting upon a wholesale vaccination of school children and teachers. Articles that they caused to be printed so excited the parents that even people who had an aversion to vaccination were terrified into having their children vaccinated. They have boasted that they would destroy our League in Berkeley, the city of its birth. THE IRON HEEL OF THE MEDICAL PROFESSION in the part two weeks has ground harder and deeper than in the past nine years of the League’s existence. Our Treasury is depleted. Briefs carrying our case against the University of California to the Appellate Court amounts to $104.90. Three lawyers’ fees, $150. Besides paid advertisements in local papers, literature, stamps, etc. There is no officer connected with our League receiving any salary. The life of our League is at stake. Can you assist us financially? If so do so at once. Interest your friends in our League, your city may be the next to be visited by an epidemic. Twenty-Seven in Sacrarnento Since January – Other Cities Suffer Same. During the year 1911, when the effect of the compulsory vaccination law could still be felt, the number of smallpox cases in Sacramento was limited to three. In 1912, following the repeal of the compulsory feature of the law and the substitution of one requiring the exclusion of unvaccinated children from the public school only when smallpox existed in the particular school or district to which they belonged, the numbers of cases mounted to twenty-nine. For the two and a half months of the year 1913 there have already been twenty-seven cases reported in this city. If this ratio is maintained the total for the year will reach 130, or more than forty-three times as much as in 1911. Smallpox is not exactly epidemic, but there is an alarming increase in the number of cases, and according to the reports of the state board of health the experience of other cities in state is not unlike that of Sacramento. The recent outbreak in Berkeley had fatal consequences for five out of ten persons who contracted the disease within one circle of focus, originating from one person, and there were thirteen cases altogether. In Imperial Valley, four out of eighteen persons died, when the disease was introduced in one of the valley towns. In almost all of the cases the patients had either not been vaccinated or not successfully vaccinated. Of 279 cases of smallpox reported in the last year and a half there were 228 where the patient had not been vaccinated, 22 not successfully, 22 successfully in childhood, from twelve to fifteen years previous, 2 where the victim had previously had smallpox and 5 where there had been successful vaccination. These figures are presented by Dr. W. F. Snow, secretary of the state board of health, who was asked yesterday to back with data the statement that there is an increased and increasing prevalence of smallpox in California and to account for the phenomena. “They are no doubt directly traceable,” said Dr. Snow, “to the modification of the compulsory vaccination law and the agitation that has been going on insistently against vaccination. 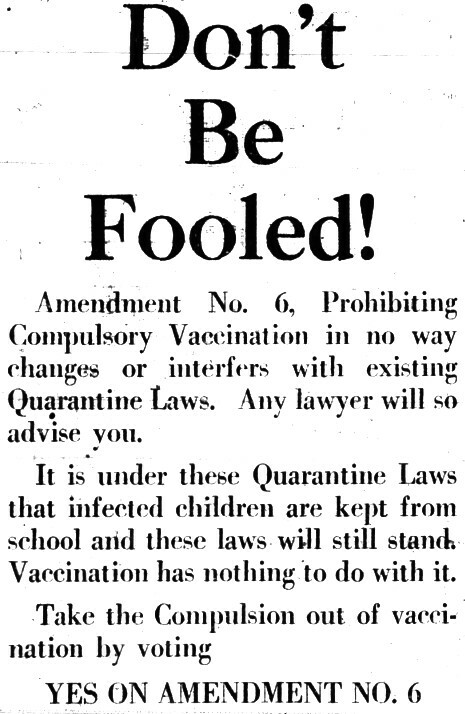 During 1907 and 1909 a very active campaign was conducted against compulsory vaccination and it finally resulted, in 1911, in the repeal of the law and the substitution of the present one. “Letting down the bars has of course produced an increasing population of unvaccinated, and the more unvacclnated there are the greater the opportunity for contamination and contagion. This danger is increased by the fact that the population of the state is increasing all the time, which, with the new ramifications of commerce, results in a larger proportion of exposures. “When a disease has once been well under control it takes time for it to become re-established, and that is what is occurring with smallpox. There seems to be no apparent reason why, now that the gate is open, smallpox cases will not go on increasing in numbers. It is not putting it too strongly to say that if we had compulsory vaccination we wouldn’t have smallpox.” Dr. Snow says also that an alarming incident in connection with the disease is that the confluent type, the most violent and loathsome of all, is becoming more prevalent. In recent years this form of the disease was almost unknown. Health Officer Jackson Temple stated yesterday that in order to prevent disappointment when the schools assemble after summer vacation next Monday, the pupils will be required to show vaccination certificates, or else certificates showing that their parents have conscientious scruples against vaccination, or else they will not be allowed to attend school. The law requires that the Board of Education furnish the certificates setting forth conscientious scruples against vaccination which will be handed to their children to be taken home for signature, by their parents. In the case of any infectious disease breaking out in a community the children who have been vaccinated will be allowed to attend school and those who have not will have to remain home. Dr. Temple further stated that Santa Rosa had been freer from cases of smallpox than possibly any other city of its size in the State and at the present time there is no case in the city limits. Wednesday morning the Press Democrat published the announcement that Health Officer Jackson Temple, M. D., would demand either a vaccination certificate or one setting forth the fact that a child’s parents had conscientious scruples against vaccination when the schools reassemble again next week. “Compulsory vaccination has been abolished by the California Legislature, and those who do not wish to have their children vaccinated have only to fill out a blank similar to the following, and the child is then not required to submit to vaccination. “In case of a smallpox epidemic the school board have the power to exclude from school all un-vaccinated children coming from the district only in which the cases are found. Signed Parent or Guardian _____________. “…Sorry, but space will not permit, we could keep you reading all day on just such data that is against vaccination. A similar theory to that of vaccination is medical inspection of school children. Compulsory treatment will be next wanted by a great many of the M. D.’s. VACCINATION MADE SAFE BY SCIENCE The anti-vaccinationists are about to lose their strongest argument. Their most telling objection against vaccination has long been that it was impossible to get absolutely pure vaccine matter; notwithstanding the greatest precautions, like the use of calves kept under specially sanitary conditions, the lymph obtained would not infrequently contain deleterious germs. According to the German Medical Weekly, however, a way has at last been found for sterilizing lymph so thoroughly that its purity can always be relied upon. This has been accomplished by Prof. E. Friedberger and Dr. B. Mlronescu, who have availed themselves of the well-known principle that the ultra-violet rays of light are destructive of bacterial life. The virus is put into small tubes of quartz-glass, which are then exposed to the ultra-violet rays from an electric lamp. In 20 or 30 minutes there is not a live germ left in them. The desks of the principals were piled high with vaccination certificates at the high school Monday after a campaign among the students, in which a certificate dated not earlier than 1907 was compulsory with the alternative of a note from the parent or guardian to the effect that they were opposed to the treatment. Dr. Jackson Temple, the health officer, was a busy man and in spite of the bruised arm which he sustained in Sunday’s accident and wore in a sling moved among the mass of students with a pleasant smile. Dr. Allen F. Gillihan. an inspector for the State Board of Health, who was formerly stationed in Santa Rosa, is facing battery charges in Chico as the result of his activity in enforcing vaccination among school children during a smallpox epidemic in that vicinity. He denies having forced vaccination where there was objections, however. PARENTS CONVERTED TO SCIENCE Over 500 children have been vaccinated by Dr. Juell, the school doctor, so far this year. It has been discovered since the vaccinating is done in the school and without charge that the number of parents who are conscientiously opposed to vaccination has dwindled from an alarmingly large number to practically none at all. Sonoma County Public Health Association Talks of New Laws at Meeting Here Yesterday in the City Hall. “…That No. 5 promises the appointment of a special board of examiners for chiropractic physicians and thereby opens the way for the appointment of at least twenty-seven other special boards of examiners for the various other similar cults in the state, is the special argument advanced against it. “No. 6 is a blow not at vaccination, which in this state is not compulsory, but it aims a death blow as well at inoculation and medication of every kind and would irrevocably tie the hands of the state board of health, making that board absolutely powerless. Further arguments advanced against it by Mr. Sullivan are that if passed it would jeopardize the lives and health of our children by permitting absolutely no disbarment from school or any other public place of persons afflicted with communicable disease, thereby giving no leverage in arresting any epidemic. “Does California want that?” asks Mr. Sullivan. If we overlook entirely the human element and put the lives of guinea pigs before those of little children, are we willing to go back to the loss of millions of hogs annually? And in reference to the charges of cruelty, the speaker made it plain that the laws of this state are in absolute accord with the requirements of the humane societies, which demand the administration of an anaesthetic in every instance before experimentation. Furthermore, all experimentation laboratories within the state are at all times open to the public. In connection with this amendment. Mr. Sulivan drew attention to the fact that it will prohibit the killing of tubercular infected cattle, except in the course of a regulation meat supply. ”Do we want this in California?” he further asked of his audience. No. 8 deals with the curbing of of the drug menace. The last legislature passed the measure and the governor placed his signature to it, showing how our lawmakers feel in the matter. On this measure a “yes” is urged…. “In event that a case of smallpox develops in a school district, the only persons who will be excluded from school will be the patient and other residents in his home. Persons who have been exposed by these other residents who have not been vaccinated will not be excluded as heretofore. This will mean a great saving to the schools, in that the attendance will not be cut down every time a remote exposure occurs in a school. “If, however, smallpox becomes very prevalent in the district, the Public Health Officer may order the entire closing of the school to all persons, no distinction being made between vaccinated and unvaccinated children. Norman Johnson, the seven year-old son of Mr. and Mrs. Gus Johnson, is ill at his home at that place with a pronounced case of smallpox. The home has been quarantined by the county health authorities and the school was closed Thursday and will reopen on Monday morning. This is the first case of smallpox in this vicinity for some years and it is causing a scare because smallpox is rapidly gaining in the state owing to carelessness in vaccination and it is serious in several parts of California. There is more smallpox now than for many years and it is increasing at an alarming rate while the illnes is more severe than it has been for years and there have been numerous deaths.